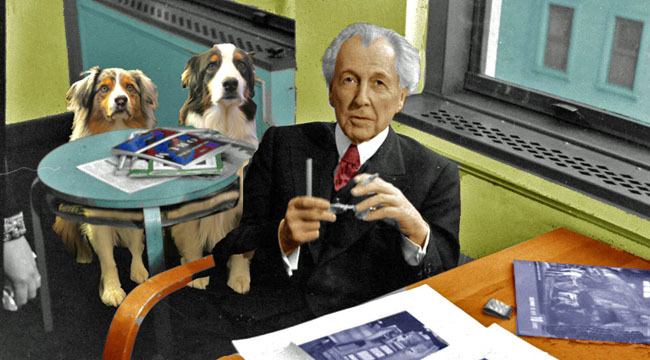 FRANK LLOYD WRIGHT ON CROSSCURRENTS, 6/8 – Doggedly Yours… Howling, Humor, and History. FRANK LLOYD WRIGHT ON CROSSCURRENTS, 6/8: He became a leader of the Prairie School movement of architecture known for organic design, Frank Lloyd Wright was born on this date in 1867. Gavin and Wyatt have joined the famed architect in his design studio as John designs a playlist for the radio studio. You are invited to celebrate Frank Lloyd Wright’s birthday on Crosscurrents, 6/8 at 8 a.m.
Little known fact: Wright’s son, John, invented Lincoln Logs. Glad to be of service. Alas and alack, FL always seemed a bit of a tortured soul–long on ambition, ego and talent and short on humility and self-control. Still, no one will remember my name in 50 years :-).